The main train station in Birobidzhan, with the city's name in both Hebrew and Russian lettering. Welcome to Birobidzhan – the capital of the “Jewish Autonomous Region” – 5,000 miles east of Moscow, 100 miles west of the Russian Far East city of Khabarovsk, and very close to the northern border of China. Entering the city, it takes only a second to realize that Yiddish was once the main language of this tidy, well-kept municipality of some 75,000 residents, of whom approximately 2,000 to 4,000 are Jewish. 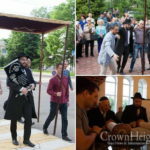 Some opine that without its unusual Jewish history, you might feel that the town is just another town in Siberia. To this day, however, whenever I mention Birobidzhan to seniors or those who know Russian Jewish history, their eyes light up in wonderment. “The forgotten city,” they tell me beamingly. Indeed, where else are you welcomed at the railroad station by a huge sign in Yiddish (and Russian)? This rail terminal reputedly remains the only station in the world with Yiddish signage. Even if you go by car, the Soviet-style, monumental welcoming sign just outside of town is in Russian and Yiddish. Birobidzhan was established in 1934 when Stalin had the bright idea of moving Jews to this bleak, lonely swampy area near his vulnerable border with China. Supposedly a proletarian Jewish culture could develop. Yiddish would be the national language, and new socialist literature and arts would replace religion as the primary expression of culture. It was Stalin’s answer to Zionism, Jewish farmers tilling the soil in a socialist republic, except that much of that soil rested on a frozen wasteland. Once the Jews had their own autonomous region, he believed, they would forget the lure of Zionism. So Soviet Jews and Jewish pioneers from all over the world, including the US, Canada, Argentina, France – good communists that they were – drained the swamps, cultivated the barren land, established agricultural cooperatives, started a Yiddish newspaper, and opened a theater, schools and various other institutions. These “true believers” literally transformed a forgotten town into a city – all in the belief that with this “socialist paradise,” they would be liberated from the unproductive trades of the so-called Jewish bourgeoisie. American Jewish communists contributed money to support this Siberian ideal. Tens of thousands of Soviet Jewish settlers traveled eastward. After all, they were people who had never before possessed land, and now they were promised their own plot of soil to farm. But by the late 1930s and early 1940s, many Jews began to flee Birobidzhan – anything to escape the misery of the region and to hide from Stalin’s mad purges. At least 2,000 Jews were murdered. At its height in the 1930s, the Jewish population of Birobidzhan may have reached 38,000. However, isolation, poor planning, and administrative ineptitude eventually drove many away. Untrained for agricultural work, the newcomers were also plagued with brutal winters, swampy land and few roads. Government mismanagement and the failure to provide it financial support also doomed it. At the end of World War II, Jews constituted one-quarter of the city’s total population of 100,000. The Soviet experiment of Jewish national building had ended in failure. Stalin died in 1953, and yet the myth lingered throughout the Cold War. By the late 1960s, the Jewish population was at 14,000. After the 1991 fall of communism, many Birobidzhanian Jews left for Israel. Today, Jews from the JAR visit Israel, and their brothers and sisters in the Jewish state come back to see family or friends; some return here for good – “though the number is not something sensational,” as reported in some American journals, says Dr. Ber (Boris) Kotlerman, senior lecturer at Bar-Ilan University’s Rena Costa Center for Yiddish Studies and author of two books on Birobidzhan, Bauhaus in Birobidzhan (with Shmuel Lavin) and In Search of Milk and Honey: The Theater of Soviet Jewish Statehood. In researching my book, The Scattered Tribe, I flew to Birobidzhan. Strolling around town, I glanced at street signs, town hall notices and posters in Yiddish and Russian, even though today only a very small minority, mostly seniors, speak Yiddish. One notices a Fiddler-on-the-Roof statue, a musical G-clef in the shape of a menora, and various markers in Yiddish on buildings once occupied by Jewish institutions. There is a taxi company bearing the name Tszimis, and a non-kosher establishment with the same name. Another non-kosher restaurant, L’Chayim on Gorky Street, serves Jewish and Russian fare. (For kosher food, one can contact the main synagogue noted in this article.) The heart of the Jewish community is located at a new Chabad-sponsored synagogue, at 14a Sholom-Aleichem Street, and a Jewish community center next door, where cultural and social activities occur, including JDC-sponsored welfare programs. Outside stands a statue in memory of victims of the Holocaust, as well as a memorial for the Jews who died in the 2008 terrorist attack in Mumbai. The synagogue features a prayer hall that seats 122; a beautifully designed ark crafted of wood imported from China; meeting rooms; a kitchen and canteen; a children’s center; and a room designated for celebrating Shabbat and Jewish culture. During much of Stalin’s time, no synagogue existed in Birobidzhan, as religion was perceived to be counterrevolutionary. The first synagogue opened at the end of World War II but closed in the mid 1960s after a fire left it severely damaged. Then, in 1968, the “hut synagogue” (so named because it resembled a wooden shtiebl, or prayer hall), was established on Mayakovskaya Street. This modest structure with a tin roof houses what is often described as a 19th-century Jewish village congregation, held together by a small membership. For many years, Israeli-born Chabad Rabbi Mordechai Scheiner served as spiritual leader, but he returned to Israel a few years ago. According to reports, Chabad Rabbi Eli Riss has been appointed. Born in Birobidzhan, he studied at Chabad in Brooklyn and was scheduled to arrive in Birobidzhan this spring. One can still buy the Birobidzhan Shtern, a newspaper that is now printed in Russian (with occasional pages in Yiddish). And with Zionism no longer taboo here, Hebrew-language study is gaining ground. The alef-bet is taught in the state kindergartens, Kotlerman pointed out. We stopped to visit a kindergarten, where the tykes in the Menora program moved us with Birobidzhan’s story in Yiddish and Hebrew songs. Afterward we joined in for some Israeli dancing. Yiddish is taught at the new School No. 23, which stands on Pionerskaya Street, near the Bira Bridge. The Sholom Aleichem State University also offers a Yiddish course, said Kotlerman, who is head of the university’s Research Center for Jewish Culture and Yiddish. The Jewish Agency offers a Hebrew course, he added. I stopped at the Vostok, the city’s only hotel, which was especially spruced up in 2004 for the town’s 70th anniversary. Will Jews will remain in the JAR in the coming decades? Both Tokayer and Iosif Brenner, a deputy of Birobidzhan’s duma, believe that economics will play a big part in their decision. Certainly a new bridge to be built over the nearby Amur River to China will enhance the area’s economic survival, as will the fact that the entire JAR could be considered a “small Kuwait” because minerals and oil exist in the Russian Far East. Brenner does not believe the Jewish community will desert the area and has this message for the outside world: “Send us your tourists. I invite them to take part in the economic development of the area.” At our farewell from the city, my wife Riva was offered a Hebrew school teaching position. “I’m honored,” she said, adding, “Let me think about it” – undoubtedly remembering Siberian winters.